On arrival in Fukushima, we were met by a lead engineering team and given a briefing on the events that had taken place in 2011, and the remaining effects on local prefectures such as the neighboring prefecture of Futaba and the residents that used to live there. Then we visited Fukushima Daiichi Nuclear Power Plant – a sight that we feel privileged to have experienced and were impressed by the resilience and appetite to recover from the disaster, and to learn so as to effectively move forward in the regeneration process. 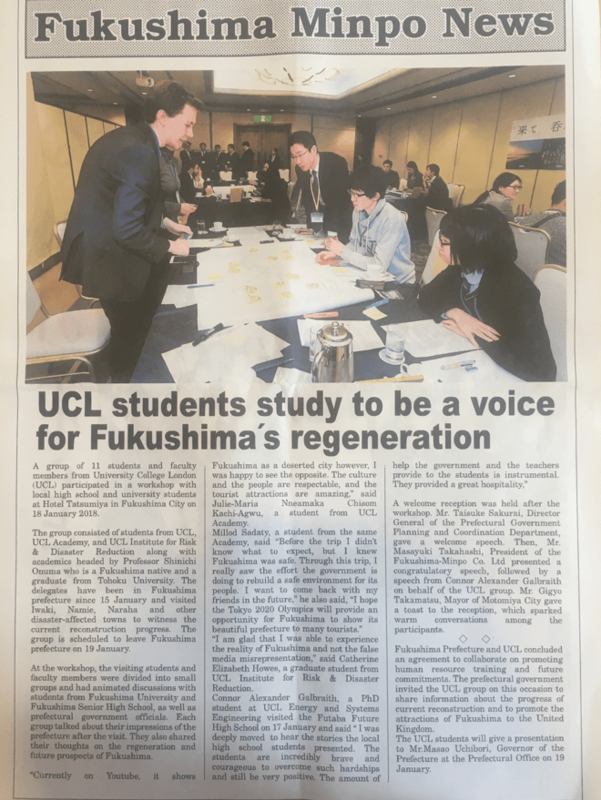 This was followed by an in-depth discussion and question and answer session between the team and two respective representatives of TEPCO, to help stimulate our appetites for our individual areas for research. Our first stop was at the Robotic Limb Factory – an innovation company, originally focusing on the creation of mobile phone components, now pushing the boundaries on physical movement assistance after disasters. 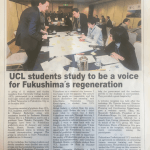 Here we learnt that since the disaster, employee numbers had been slow to return, however they were working hard to push Fukushima as a place for testing new and vital technologies, and above all a desire to work in the region. Then we went to one of the hardest-hit areas named Futaba-gun. Our first stop was a graveyard, home to the remnants of the previous residents of the unfortunate village, completely wiped out by the Tsunami. Here we were also taken to the waterfront by the local port, recently repaired and home to a very small 20-strong fishing fleet, to reflect on the damage caused. Our final visit of the day was to a previous high school, now re-utilised by the prefecture as a museum for visitors. Here we were greeted by a local storyteller, who reminisced with us as we sat in the junior student chairs, of how the local area had been effected and how she had been scared for the safety of her grandson after the disasters. On Wednesday we were privileged to spend time visiting some incredible members of the local area, who work tirelessly to rebuild and strengthen their communities. We started the day hearing from Aoki-san, a local storyteller who talked to us about the evacuation of her town after the nuclear accident. We travelled to the J-Village and spoke with Chef Nishi, who set up a restaurant to help the workers travelling to assist in the stablisation and cleanup of Fukushima Daiichi. We ended the day as guests at the Futaba Mirai Gakuen High School. We were treated to a presentation from the students on their views of the situation in Fukushima. We then heard poignant speeches from two students, regarding their personal experiences since March 2011. The whole group were deeply moved by this testimony, and inspired by the positivity and kindness of the students. We spent a fascinating morning at the National Institute of Advanced Industrial Science and Technology in Koriyama City. We were given a full tour of the facility, and were very impressed with the innovative research into renewable energy that the centre is undertaking. 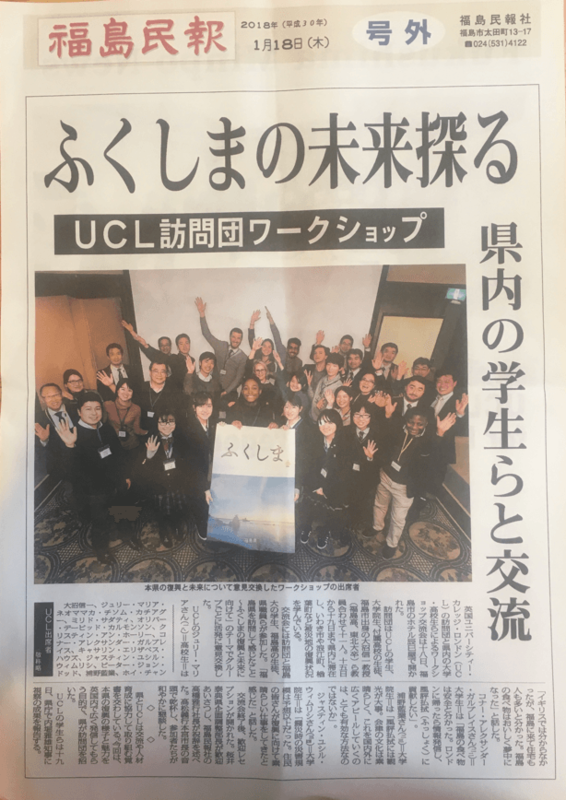 Later, we took part in a thought-provoking workshop with government officials and students from Fukushima University and High School, discussing the future of the prefecture. That evening, we were invited to a reception welcoming us to the city. 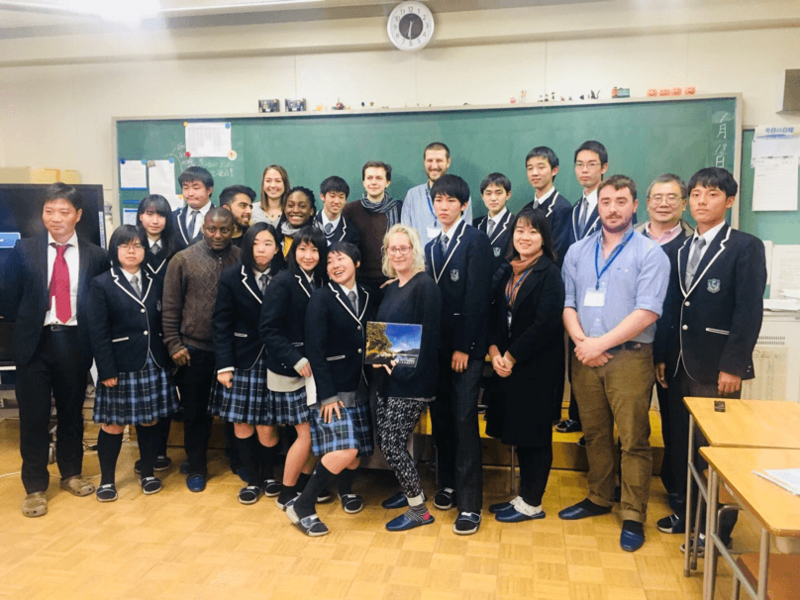 We very much enjoyed speaking further with students and officials from the earlier workshop, and to hear their thoughts and plans for the future of Fukushima. On the last day, we visited the electric power station that conducts binary generation using the heat from the Tsuchiyu hot spring located in the upstream of Arakawa river. It is an example of local efforts to create new energy alternatives to nuclear power. We then went to the Environmental Regeneration Plaza in Fukushima City, where we were told about the progress of environmental recovery in Fukushima, about radiation and about environmental regeneration such as interim storage sites. After the site visit, we met with the Governor of Fukushima Prefecture, Mr Masao Uchibori. The Governor expressed his thanks for our visit and listened to our impressions of the recovery in Fukushima. We then had a lecture on disaster prevention in the Crisis management Centre of Fukushima Prefecture. 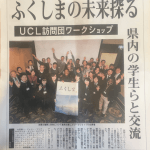 We concluded our 5-day trip to Fukushima on 20th February and returned to London. It was an amazing experience and insight into post-disaster recovery and Japanese culture, and we will continue to pay attention to the reconstruction of Fukushima into the future.